Montgomery County DOT has finished mapping out where bike route signs will go on its upper Bethesda route. Much of the work was just identifying the route. The county is officially calling it the “Montgomery Mall to Downtown Bethesda route”. They’ve already completed the design task for two other signed routes, running along the Georgia Ave. corridor and Rt. 29 corridor respectively, and signs are expected to go up this summer. These routes will likely get route numbers if the county adopts a bike route numbering system. Below is the list of turns, or see the map. There are some faster variations, but this route has fewer safety issues. Planned sign format with destinations and mileage. The word "miles" will be omitted. There were some destination questions, like what do you say on the signs at the start of the route on Bethesda Ave? There are faster ways to get to NIH or Tuckerman Lane (depending what part). Cabin John Park has multiple entrances miles apart. A good destination to post would be Rockville (the western side at least) but the signs don’t take you that far. Southbound, downtown Bethesda is expansive and the Capital Crescent Trail has multiple access points. The signs don’t actually reach the CCT but they will clearly direct you to the Woodmont Ave. access point (and somewhat less clearly to the Glenbrook Rd access point). Signs at the Woodmont access point are another ball of wax (or can of worms?) and are a task for the future. 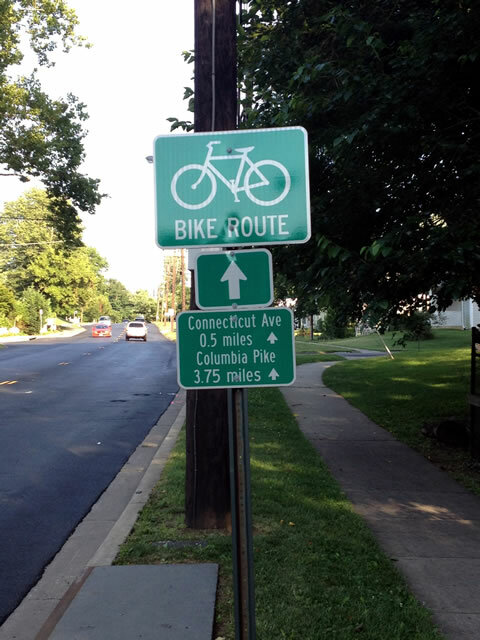 The county is funding this signage project as well as the others via a new state bikeway grant program. This Bethesda bike route is very useful, but the triple sign format seems awkward, costly, and outdated, as opposed to integrating all the icons, arrows, and wayfinding information in a single, rectangular sign. It would then be easy to add a small numbered bike route sign at the top, if the route is numbered in the future. Yes, it would be nice if it could be on one panel together. It is good to have a modular design, though I’m not sure how much difference it makes. P.S. I’m not sure why your comment required moderator approval. It’s supposed to only require it for a user’s first post. that route to the mall from bethesda is ugly, boring and BUMPY. there’s nothing of interest and it traverses pasts the homes of SUPER SUPER rich people and their homes..until you hear the roar of the highway…. these are the same people who oppose anything that promotes social and economic justice. they are all white. they are all booooo-ring. none ride a bike for transport. Well, I use the route south of Democracy Blvd at least once a week. It’s better (and smoother) than most of the Bethesda Trolley Trail and a lot better than Bradley Blvd or Old Georgetown Rd. (Actually I take Ewing and Roosevelt instead of Lindale & Sonoma, for speed). South of Wilson some of the homes are at filthy Potomac rich levels, while north it’s not quite so bad. I kind like seeing all the garish things people have down with tear-downs as well as the nice architecture of some homes. In any case I don’t own one of them, I just ride past them. The section north of Democracy Blvd isn’t very nice, just trying to get up to Tuckerman at that point. P.S. First comment by an individual on this blog is moderated, subsequent comments should not require moderation. Hope that’s working properly. This route should be called the “Jack Cochrane Trail,” considering that it basically connects your house to downtown Bethesda. In retrospect, after signing all the destinations and mileages, this probably was not the highest priority route to sign, given the years it will take to sign a dozen very important routes. The Bethesda Trolley Trail combined with Tuckerman Lane is just as fast and has about 20 fewer turns. The BTT is certainly a faster way from downtown Bethesda to NIH. But the BTT is not without its problems near NIH and the route here is useful to get to the Capital Crescent Trail heading to D.C.
Our next focus for signing will be getting from Forest Glen Rd. and Dennis Ave to downtown Silver Spring, a really important destination where the existing routes being signed leave you hanging. Of course we also need to finish the damned BTT and not get too distracted by signing.